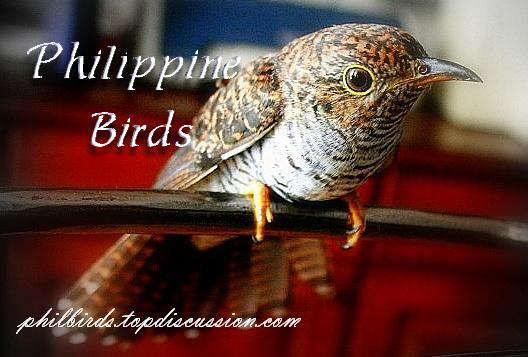 Finally, a forum for Pinoys interested in birds, whether it be bird keeping or bird watching! Any problems in the forum? Any suggestions? Post your questions here. Share your thoughts on any topics about Avian Wildlife here. Post your pictures and your thoughts about birding in the Philippines. Birders of Cebu and Bohol, share your experiences here. Any problems on identifying a certain bird? Post your pictures and descriptions here for experienced birders to identify them for you. General Discussion about Birding in the Philippines wherever you are, tips on birding and great birding spots. Post anything related to aviculture here, not sure what bird you have? Ask around here so our experienced aviculturists can help you. Mahalin ang sarili, love your own. Love our own local birds. Some Aviculturists have been able to breed our local birds succesfully, if you have any questions regarding our local birds or any rescued birds then this is the place for you. All hooked billed Psitaccine friends here. Post your chattering friend here. Any questions about parrots? Ask here. Smaller Psittacine friends with long tails here. Talk about your favorite parakeet. Chat about your favorite medium-sized crested friend here. Emeralds, Cinammons, Lutinos, whitefaces and more! Honey loving, nectar sucking hookbills. A tribute to these beautiful birds. One of the most popular birds in Aviculture, the Love birds. Sociable and cute, here here for the active little finches. Columbiformes unite! All into pigeons and doves here. Galliformes here. Poultry can include, peacocks, pheasants, and chickens. A board dedicated to our oh-so-rare falconers and especially for those rescued raptors. None of the Boards fit your bird? Fit them in here. All about breeding and raising your avian friends. Questions about bird health and nutrition here. What to feed, how to feed and such. Training your pet to be like Alex the African Grey Parrot, and freeflighted birds of Chris Biro. Share your equipment used for photography. Let us shoot wild birds the right way... with a camera. Share your pictures of beautiful wild birds. Any bird photo? Pet birds? Urban birds? Share them here. Birds and bird related stuff for sale here. Looking for something? Ask around here.